If the most recent polls are of any indication, conservative Matt Bevin has some significant ground to make up if he is going to DEFEAT his liberal Democrat opponent to WIN Kentucky’s governorship in November. The most recent public opinion polling available shows conservative Matt Bevin trailing his liberal opponent, Democrat Attorney General Jack Conway by 11 points (37 – 48 percent). However, there is perhaps a “silver lining” to these less than cheerful polling numbers. The survey itself was fielded from 5/5 – 5/15 and prior to the intensely divisive three-way GOP primary election. In fact, there are already hopeful signs that supporters of the one-time GOP primary rivals are “coming home” to support the nominee after a bitter primary. Admittedly with a bit of worry, there still remains a lack of recent polling data to support this wishful speculation. In any event, what we do know for sure is that the battle for Kentucky’s Governorship will be intensely fought on a national scale. It is incredibly important for conservative Matt Bevin to win this governor’s race not only for Kentucky, but also for America. The fact is, Kentucky is at the very epicenter of Obama’s War on Coal. We CANNOT allow Obama and his radical gang of “junk science” apparatchiks to gain a foothold in Kentucky. Obama and Clinton are desperate to WIN Kentucky, and are pumping millions of dollars into independent campaign efforts to destroy conservative Matt Bevin. If Matt Bevin is going to WIN this high-stakes gubernatorial race, he’ll need conservatives to rally their support and finances behind him “to the max”. Many conservatives have already given all they’re legally allowed to donate Matt Bevin. Kentucky State Law allows ONLY individuals to contribute a maximum of $1,000 per election to a candidate. However, there are NO contribution limits for independent groups like Revive America PAC, who are supporting Matt Bevin. In fact, not only can individuals make unlimited donations to Revive America PAC’s independent effort for Matt Bevin, but businesses, including corporations are allowed to donate too. 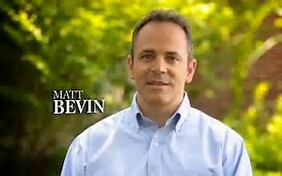 Please consider making an urgent donation right now to help us to elect Matt Bevin as Governor. After a long and exhausting primary campaign, conservative Matt Bevin urgently needs our financial backing to WIN in November. Please consider making a donation today of $25, $50, $250, $500, $1,000, $2,500, or even $5,000. more to help us to elect this bold, conservative leader. No contribution is too small, and every donation helps. Revive America PAC is an independent expenditure only committee. We are registered with the Federal Election Commission, accept unlimited contributions from individuals, corporations, and political action committees, and report information about our contributions and expenditures as required by law.Contributions to Revive America PAC are not deductible as charitable contributions for federal income tax purposes. *Federal law requires us to use best efforts to collect and report the name, address, occupation and employer of each individual whose aggregate contributions exceed $200 in a calendar year.